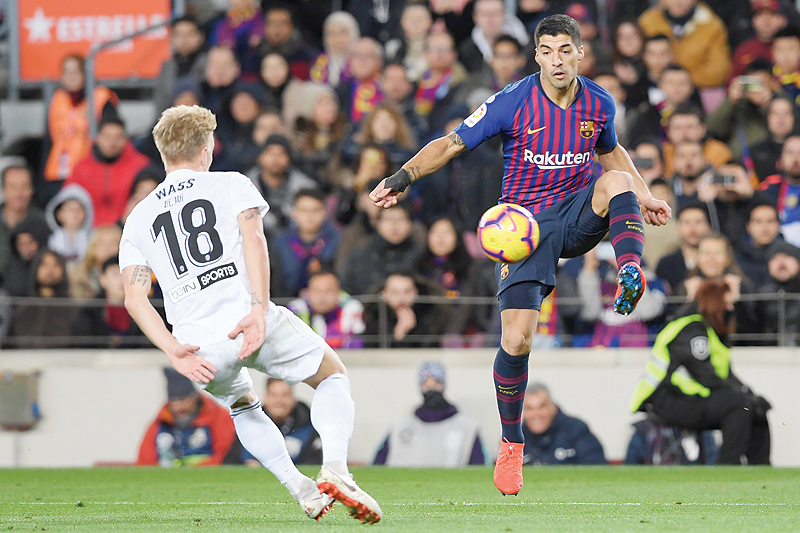 BARCELONA: Lionel Messi scored in a ninth consecutive match but his latest double on Saturday was only enough to earn Barcelona a 2-2 draw against Valencia. Messi instigated another Barca comeback at the Camp Nou before placing an injury doubt over his availability for Wednesday’s Copa del Rey Clasico against Real Madrid. Ernesto Valverde confirmed after the game his captain had felt a “small problem” but insisted it was nothing serious. Valverde is still unlikely to take any risks given Barcelona’s testing month ahead, even if Messi’s absence, however brief, would be a blow, particularly while he is in such irresistible form. After eight consecutive Barcelona wins in La Liga, this result perhaps offered the chasing pack a little encouragement at least. Real could inflict further disruption themselves. The first leg of the Copa del Rey semi-finals on Wednesday will be the first of three Clasicos in a month. The latter two will be back-to-back, within four days. But Messi fit and in this sort of form means any confidence Real feel comes with an asterisk. His 12 goals in his last nine games is the same number the whole Valencia squad managed in their first 15 league matches. Valencia were 15th in December, with only three wins, and their coach Marcelino was under pressure, just six months after propelling them back into the Champions League. The club kept faith and results have improved. They have now lost only one of their last seven matches and are within sight of the top four. Valencia deserved their first-half lead and could have scored sooner, Parejo drawing a smart save from Marc-Andre ter Stegen before Denis Cheryshev lashed the rebound off the far post. The visitors rode their luck as two decisions went their way in a matter of minutes. First, Barca could have had a penalty when Gabriel Paulista blocked Nelson Semedo’s shot with his hand. Then the home team should have had a free-kick as Messi was bundled over by Parejo. The latter proved key, with Valencia sprawling forward on the counter-attack. Rodrigo carried the ball 40 yards before slipping a cute reverse pass behind Vermaelen and Gameiro banged in the finish. Valencia’s penalty was clear after Sergi shoved Daniel Wass in the back, with Parejo whipping the ball into the corner to make it two.